Recent surveys have shown that companies list “finding and keeping quality workers” as their biggest problem. The solution? Performance coaching. There may be no other skill set as paramount to manager or supervisor success as coaching skills. This Ebook by The Impact Achievement Group provides insight into the critical elements that make up an effective coaching process. What truly constitutes a performance-driven culture? How does an organization measure—and review—performance in a way that truly benefits the company as well as its employees? The answers to these questions are the difference between an average and an extraordinary business. Authors and experts Rick Tate and Julie White, Ph.D., senior managing partners at Impact Achievement Group, and Dan Harrison, Ph.D. of Harrison Assessments International, have contributed to this Ebook, which provides best practices in performance management and leadership development. These articles offer sound advice based on years of on-the-ground experience coupled with current, proprietary research findings. Among the many responsibilities required to effectively manage others, coaching is at the top of the list. A leader must recognize the performance needs of the direct reports and give them the confidence that they can accomplish their task responsibilities through their own skills. The article, Performance Coaching Flexibility: Every Great Manager Has It, discusses how managers must break an employee's performance down into specific tasks in order to diagnose what the specific performance issue actually is. Performance problem situations are a supervisor or manager’s defining moments The way these defining moments are dealt with can either trap you in a cycle of limitations, decreasing the quality of your work life, or enable you to manage performance effectively. This article, Handling Performance Problems, is based on Module #8 from the popular Supervisory Basics training series from Impact Achievement Group. It offers tips and guidance for new confronting and addressing performance problem situations. During the steady march from a manufacturing to a service economy, businesses that succeeded learned a key lesson. Competing in an era where customers no longer tolerated poor quality required the proactive involvement of people able to take personal responsibility for the creation, sales, and delivery of quality products. Businesses, large and small, learned this lesson well, contributing to a different standard for world-class products and professional services. Unfortunately, many organizations failed to address their next challenge in the same successful manner. A major revelation emerged in the early 90’s—the way a business treated their customer paid dividends. Sadly, while customer service levels in various industries saw slight improvements, levels of customer loyalty, service satisfaction, and customer experiences today are average at best. The challenge is clear: a good product and/or professional service and competitive pricing have now become the ante just to get into the game. Winning and losing are now a function of the human factors that set the tone for the customer. The Morale and Motivation Myth … No Strings Attached! For over 40 years the tenet that “happy employees are productive employees” has been the driving force for employee motivation practices and management training—despite clinical evidence to the contrary. The latest research article from Impact Achievement Group, “The Morale and Motivation Myth … No Strings Attached!” provides insight into why, with the best intentions, reward and recognition programs are often doomed to fail; why productivity leads to happiness, not vice versa and; the critical role managers play in engaging workers, with no strings attached. While performance review serves an important business purpose, the reality of the review experience—for both managers and employees—delivers disappointing results. That disappointment can spell disaster for your organization. The latest article from Impact Achievement Group, “The Dark Side of Performance Reviews – Why People Hate Them and Why They Fail,” explains 1) what the essential purpose of a performance review process is, 2) how to establish a fair and consistent process so that employees can know where they stand, and 3) how to evaluate results rather than activity and effort. Without a consistent and fair performance reviews process, top performers become discouraged and look for new opportunities while low performers aren’t challenged to rise above mediocrity. Unwanted turnover and decreased productivity result. A new study by Impact Achievement Group, “The Performance Review Process: Facts and Fiction,” reveals how 1) Managers and supervisors tend to group performance marks for employees toward the middle of the rating scale... 2) at least half the time, poor performance marks don’t translate to appropriate corrective action.... and 3) how a significant disparity exists between how CEOs and VPs view the performance review process and how everyone else does. The ultimate purpose of coaching in an organization is to engage employees and capture their discretionary performance. Engaged, talented workers are prime drivers of overall productivity. When managers and supervisors rely on cookie-cutter coaching that does not consider individual performance levels in context, under-management results. Impact Achievement Group’s latest study reveals how managers and supervisors measure up to the vital coaching task. For a limited time, Impact Achievement Group is offering Chapter Two of our best selling book for free -- online. Read this chapter (Motivation at Work) to learn about how to turn organizations around... particularly ones that often show lack of employee morale, extremely low productivity, or disrespect for authority. Published in Workforce Performance Solutions Magazine. By 1980, “Star Wars” had taken the movie-going public by storm—and in the business world, the “Quality Wars” had begun. Successful businesses learned a major lesson: When you compete in an arena where customers no longer tolerate poor-quality products, it’s essential to get employees actively involved and improve their ability to deliver quality products. If only we had truly learned that lesson. Today, good product and competitive pricing have become the bare minimum required just to get into the game. Winning and losing have become functions of the “human factor” that sets the tone for the customer. 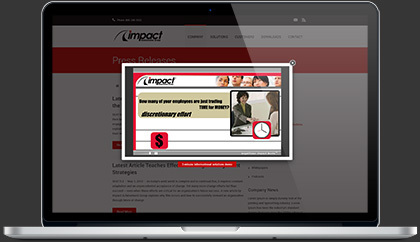 Impact Achievement Group is a training and performance management consulting company that provides assessments, coaching, story-based interactive workshops, and simulations for managers at all levels of organizations worldwide.